A young rider enjoying Transoeste, Rio de Janeiro, Brazil. Photo by Mariana Gil – EMBARQBrasil. On March 14, the World Health Organization (WHO) released its latest Global Status Report on Road Safety, previously published in 2009. The Global Status Report is the authoritative document for traffic safety. The 2009 publication of the report included just two references to mass transport embedded within the global road safety status section — the first highlighting safety risks on public transport around the world and the second on the need to prioritize the safety of pedestrians and cyclists on roadways. This year’s report devotes a full section of the Transport Policies chapter to the connection between public transport and safer roads. The fact that the report is including this section is an encouraging sign of a growing recognition that mass transportation and urban planning have a positive impact on traffic safety. The 2013 Global Status Report section on Transport Policy observes that, in both developed countries and the developing world, public transport has been shown to be a safer mode of transport than private cars. 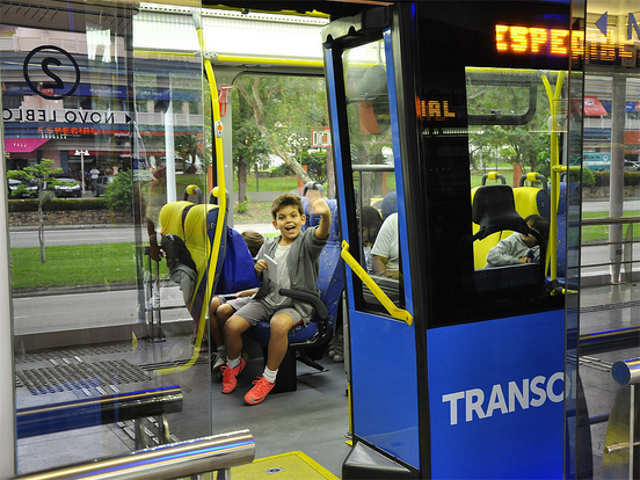 “Safe public transport systems,” the report explains, “are increasingly viewed as important to improving mobility safety, particularly in urban areas with increasing traffic congestion” (Global Status Report 2013, page 33). The report also observes a rise in physical activity and overall health with the investment and promotion of safe public transport. In order to make urban mobility both safer and more effective in reducing traffic volume, the WHO encourages governments to focus on making public transport systems safe, accessible, and affordable. Citing a case study I co-authored with EMBARQ India Director Madhav Pai, the report offers the example of Ahmedabad, India and the implementation of an advanced bus system there (p. 34). The WHO’s detailed individual country assessments in the appendices of the report are built on five pillars, and research from EMBARQ has contributed to the pillar on Safer Roads and Mobility. The report also includes a case study of New York mayor Michael Bloomberg’s action plan for pedestrian safety (p. 31). Mayor Bloomberg, who spoke at the launch of this year’s report, cited sustainable transport solutions, such as advanced bus systems, increased pedestrian space, and protected bike lanes, as proven examples of “what works”. How does mass transport increase road safety? Public transportation offers benefits to both commuters and residents, on the roads, on bicycles, and on foot. “Sustainable transport,” observes Dario Hidalgo in a recent post on TheCityFix, “in the form of protected facilities for walking and biking and well designed and operated public transport systems … can help reducing trips in individual motor vehicles and making these trips of good quality – less hazardous than driving a private vehicle to work, not only for the vehicle’s driver but for all road users.” When commuters opt for the bus over their own cars, they dramatically reduce the likelihood of injury or death in traffic accidents. Sustainable transport also helps mitigate the health risks of poor air quality, due to particle emissions from automobiles. Advanced bus systems, such as that of Ahmedabad, India, are designed to create safety for pedestrians going in and out of the stations, and crossing the streets. Speeds are reduced in these areas, and bus drivers are trained to recognize and reduce accident risk. The city of Ahmedabad is projected to grow from 5.5 million inhabitants today, to 13.2 million by 2040. If the city’s development continues on a path of lowering density, rapid expansion, and increased auto use, EMBARQ estimates it will also witness an increase in annual traffic fatalities from 240 to almost 7300 — amounting to a 3,000% increase. On the other hand, if the city chooses a more sustainable path, by expanding along high-density transit corridors and promoting high quality public transport (thereby curbing the increase in vehicle travel) we estimate it can reduce fatalities in 2040 by over 5,500. There are additional benefits, such as a reduction of CO2 emissions by over 10 million tons per year. In a context of continued urbanization, and given the current motorization trends, increases in both vehicle travel and traffic fatalities are inevitable to some extent. At a more detailed level, the implementation of a high-quality public transport system – such as the Janmarg bus rapid transit (BRT) in Ahmedabad – can significantly improve safety along the streets where the advanced bus system operates. According to data from the Center for Environmental Planning and Technology in Ahmedabad, the implementation of the Janmarg BRT has resulted in a 55% reduction in fatalities, a 28% reduction in injuries, and a 32% reduction across all crash types. How cities are designed and how mobility within those cities is provided are key components of traffic safety. When carefully designed to avoid or minimize risk, sustainable transport and urban development can save lives by improving traffic safety, reducing air pollution, and encouraging physical activity.